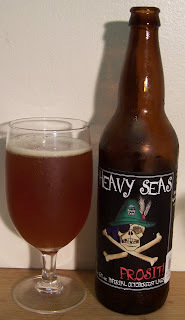 John's Bier Blog: Heavy Seas Prosit! Pours a nice amber with a white head. It did not generate much of a head. That may be because this beer was very cold when I poured it. Sweet toasted malts on the nose along with just a hint of flowing hops. This is a very nice Oktoberfest; full with toasted malt flavor. 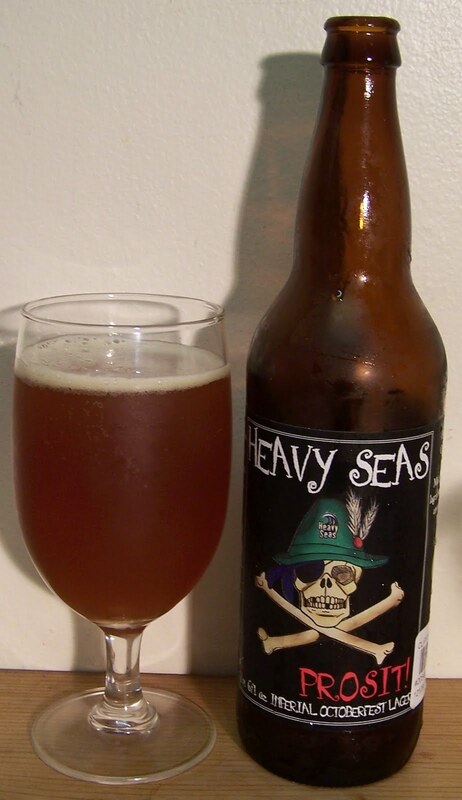 It is also hard to believe that this is 9% ABV, you really can not detect the alcohol at all. The taste starts with nice sweet toasted malts then a nice cleansing in mid sip and then an impressive dry finish but with no real hop bitterness. The final aftertaste if any is of sweet toasted malt. As this beer warms it just gets even better. It is very rich and smooth, well, more so then it was when it was colder. You can also start to detect the alcohol as it warms and opens up a little. This is an impressive beer. I don’t have my temperature probe handy but this beer has to be close to room temperature now and it’s the best it’s been throughout this review. This has turned into one of those bees that you just want to keep nursing and never finish. Well all good things must come to an end and so to with his beer. I have to give this a B+. That may be a little low but I’ve had a few of the German Oktoberfest that were solid A’s and this beer falls short of that mark. All and all this is a very good Oktoberfest. I highly recommend this to anyone that like the traditional toasted malt taste of an Oktoberfest.